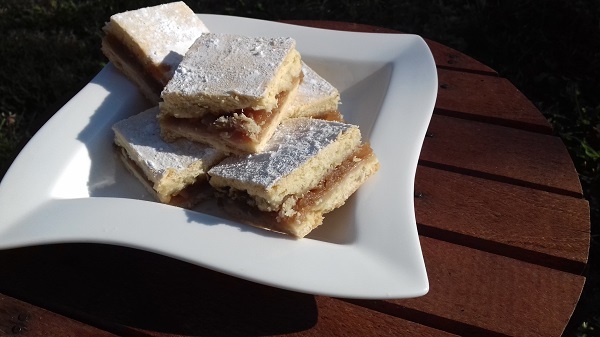 These Caramel Shortbread Squares are simply amazing. With a buttery crust and a beautifully filling of caramel, this squares are perfect low-carb treats. This recipe is Low Carb, Keto, THM S, Gluten-Free, Grain-Free, and Sugar-Free. Line the bottom of a two 9 inch square cake pans with parchment paper. Mix the crust ingredients in a food processor until the dough comes together. Press into the bottom of the prepared cake pans. Bake for 16-20 minutes at 350 degrees until golden brown. Meanwhile, combine the sweetener, cream, and butter in a medium saucepan. Cook over medium, stirring frequently, until deep golden brown and thickened. Depending on the heat of your stovetop this can take 10-15 minutes. Pour the caramel over the first cooled crust. Store at room temperature for 2-3 days.